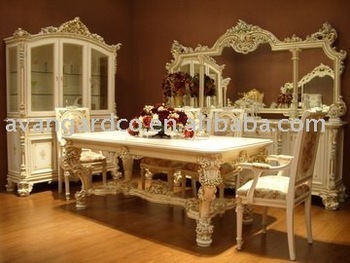 Antique High quality european style dining room furniture set. Antique High quality european style dining room furniture set..
We offer a large variety of European style furniture,such as sofa,bedroom set,living room set,and so on.ZhaoQing Bisini Furniture And Decoration Co.,Ltd is a professional furniture manufacturing enterprise.We have rich experience in the design,development,production and sale of furniture. we make difference kinds of antique reproduction furniture and home decoratived items. Also we offer interior design and construction material to give customers a complete luxury house solution. Bisini Furniture provide a cost efficient,quality conscious pathway into manufacture in China.We also have strong capability to design and manufacture products according to customers' specifications. We are sincerely looking forward to cooperate with you in the near future.Best regard. Zhaoqing Bisini Furniture And Decoration Co., Ltd.